This is something for the IT Pros and Devs amongst us. Normal folks will probably not understand what I am talking about here. But you can always support a good cause right? The Server community has enjoyed something since Server 2012 that is called DeDuplication. This is a HDD data storage technology that writes data to disk at block level only once throughout the lifetime of the file. Your typical file are broken down to unique chunks of data called blocks. These blocks are then written sequentially logically to disk. Now imagine all your typical Word Document, with Aaa, and Bbbs and “the” etc etc. We are at the GUI level forever repeating the same words and letters and phrases. Now the clever heads of the Data Storage world have found out that if you look at these files at chuck level, a lot of the small pieces that make up the files really are more or less alike binary wise. So why not hash these chunks or blocks with unique values, and save them to disk while keeping a table of all the hashes. So next time as a job seeker when you want to save that letter with Dear Sir, we can find out that you’ve already writing a thousand solicitation letter beginning with Dear Sir, so we just throw that part away and save only what we don’t have in the Hash table. I.e. We only save every data once! Think of the storage savings! Now brings me to the IT Pro/Dev headaches. We that stay awake at night while normal folks sleep, hacking away at code, we have one thing in common, we work with Virtual Machines. And virtual machines have the nasty habits of filling your disk in no time to the brim. But funny thing about VM files is that 90% is just a repetition of files! Really. Just take you typical Windows folder and its sub-directories. They contain the same files over and over. So if you have 10 VMs of say Windows each at about 20GB total file size, with DeDup you can reduce this size by about 90%. You’ve heard about Microsoft Azure, and wonder how Microsoft is able to host the whole world on their Cloud, they are able to do that because of DeDup functionality. Every client is running on a VM based on Windows. Imagine the savings DeDup is getting Microsoft. Sometimes I am just curious how much is MS Azure DeDup savings. I guess we will never know. So the Server guys all rejoice now with DeDup for saving Storage costs, but we IT-Pros and Devs lug around our Surface Pros and Notebooks full of VMs with no savings. Most modern device only come with SSDs, you can imagine where DeDup is most needed. 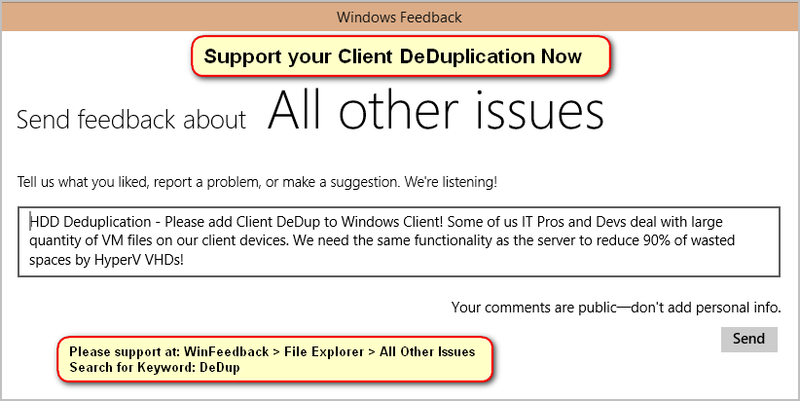 Therefore it is not a luxury to have DeDuplication on Windows Clients like Win8 and Win10. 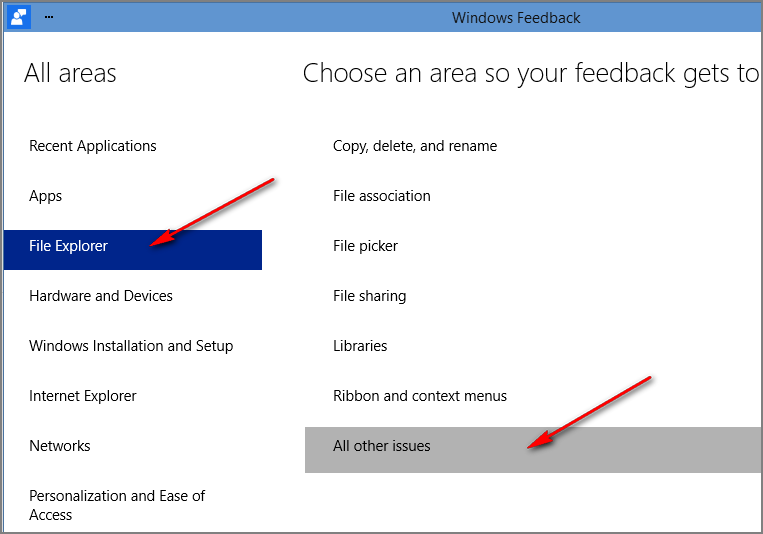 It is a necessity, and Microsoft should implement it with Win10. They should make it part of the Consumer features to be exposed next year. You should find my entry as the opening picture above. 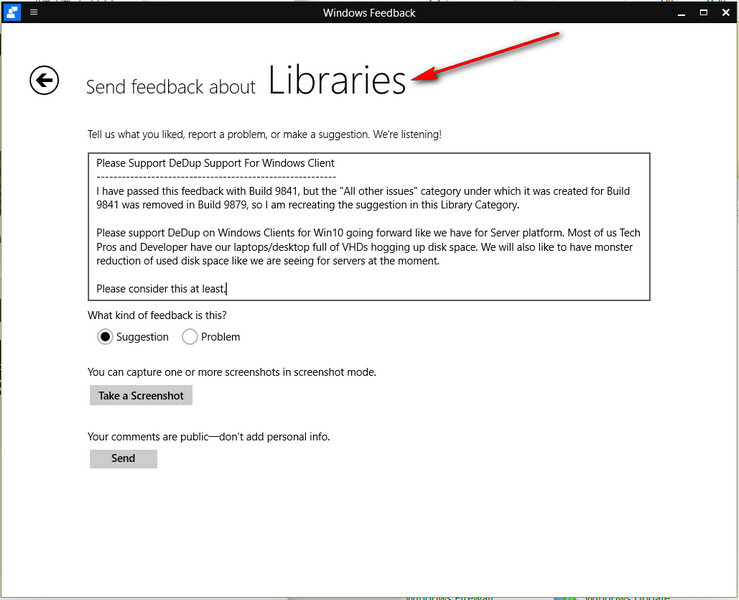 Please add your own to make Microsoft take this seriously. Our thanks to @Faraby for bringing this to our attention. I have tried to do as you suggest, but there is no more “All other isues” listed. Hey, thanks for your attention buddy. As you can see, there’s an update in the post. You can now join the clarion call. Thanks once again.